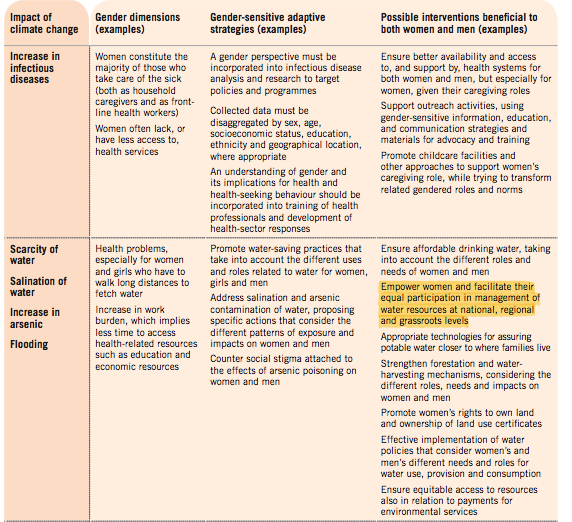 Preparations for, and responses to, climate change need to be sensitive to gender dimensions of health care (including mental) and health-seeking behaviours. While much of the media coverage surrounding global climate change is centered on the geographical devastations that are likely to result from such catastrophe, the 2011 WHO Report on “Gender, Cimate Change, and Health” spotlights the consequences of global climate change on a social level. 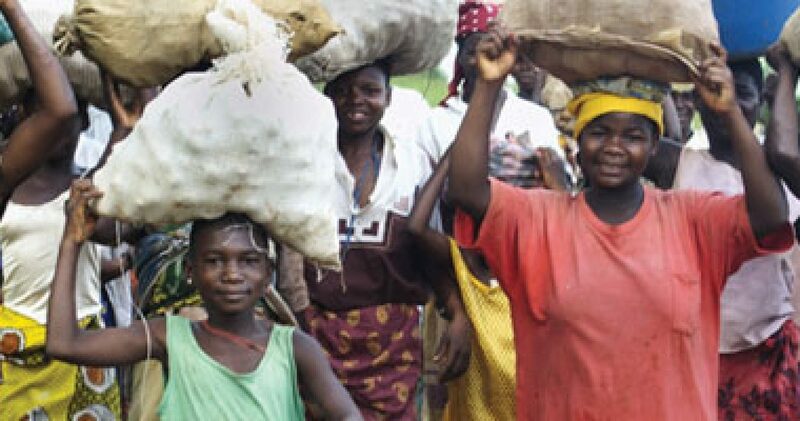 According to the report, women and men are apt to suffer varying consequences based on their social role, status, and physical/behavioral capacities. Many of the ramifications that are associated with climate change show “gender differentials” that include gender differences in physiological, behavioral, and socially constructed health risks and the vulnerability to long-term effects of such hazards. Despite disasters entailing negative consequences for all victims involved, more women than men are killed in these catastrophes or women are killed at a younger age. These statistics are strongest in countries where women have low social, political, and economic status in comparison to men. While life expectancy for women is generally higher than men, studies have shown that natural disasters lower the life expectancy of women more so than men – narrowing the gap in life expectancy among women and men. Natural disasters have entailed consequences particularly detrimental towards women. In a 1991 cyclone disaster in Bangladesh, 90% of the 140,000 victims were women. (Aguilar, 2004). Similarly, in May 2008, a cyclone in Myanmar killed 130,000 victims, of which 61% were women (Care Canada, 2010). How can we combat the gender gap in natural disaster fatalities? Equity and social justice cannot be achieved without recognizing the differences in vulnerability and strengths of women and men, and the various factors that contribute to this vulnerability. Strategies that acknowledge gender differences and particular strengths have the ability to not only increase the survival rate of women, but of all those afflicted by natural disasters caused by climate change. By involving women in the disaster preparation process and enabling equal participation in the management of resources and disaster preventive strategies, such interventions can benefit men and women. For example, in 1998 in a municipality in Honduras called La Masica with a population of 336 people, emergency disaster preparation strategies established 6 months before the anticipated hurricane included women’s participation in all relief operations including rescue missions, local infrastructure rehabilitation, and food distribution. In preparation, a local disaster agency conducted gender-sensitive lectures on hazard management activities. Moreover, women were given the responsibility of monitoring the early warning system, a task usually set aside for men. As a result, no deaths were reported after the hurricane. In the face of disaster, allowing women to have an integral role in the disaster preparation process will enable united communities to prepare and ensure the welfare and well-being of each other. Images courtesy of WUN and the UN’s WomenWatch.